Change is Hard. It’s Not a Cliché, Just a Basic Law of Nature. 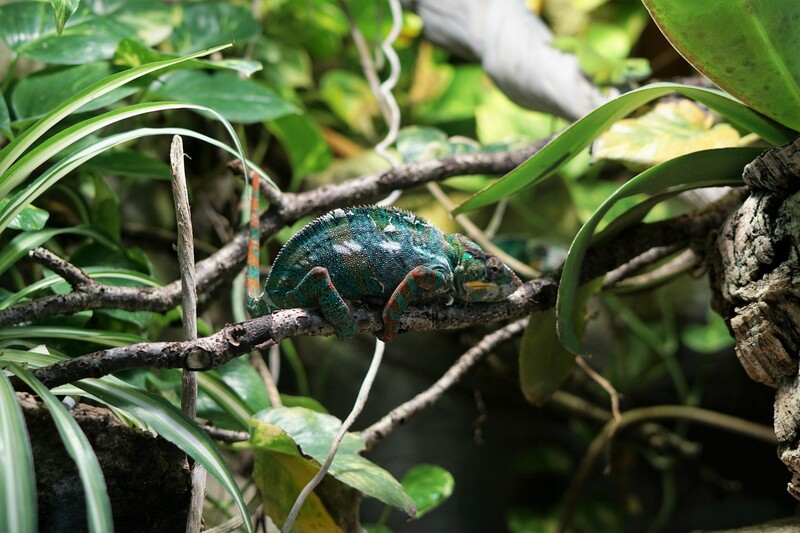 It’s not an accident that the greatest money manager of all time, Peter Lynch, was nicknamed The Chameleon. He earned his moniker because he perceived the changing financial market environments which he found himself in and adapted his style accordingly. But here’s the thing. Change is hard. Transformation is rarely an easy and comfortable process. Whatever the challenge, whether starting a new diet or adapting to a new way of working, desire and motivation alone are often not enough to change the status quo. The same golden rule applies in the workplace. In fact, beyond willpower, personal capacities to operate within new organizational systems are necessary to overcome the resistance to what James O’Toole characterizes as “the ideology of comfort and the tyranny of custom.” Self-organizing systems like Holacracy — an organizational operating system I depict in Part 1 of this article series — are big changes for conventional organizations. In many ways, Holacracy is a disruptive technology. It requires changing behaviors and habits throughout the company to effectively instill and sustain the shift. Before I dive into how such shifts operate and the necessary ingredients to make such fundamental change happen and stick successfully, let’s look at some of the basic concepts of behaviors and see how they translate into a Holacracy environment. I recently stumbled upon “The Backwards Brain Bicycle” video featuring the fascinating journey of Destin Sandlin, an engineer for the Department of Defense. The video takes the viewer through Destin’s experiment in learning the reverse steering of a bike. His journey is an excellent analogy to explain the learning curve of Holacracy. What is so interesting about this experiment? Freeing our brain from our cognitive biases is not an instant process. It takes time to overcome our own fixed mindset and to rewrite our body’s physical routines. Similarly, making the leap to Holacracy requires people in the organization to change their patterns and, no matter how much they have cognitively and conceptually digested Holacracy, it takes a great deal of effort, discipline and patience to embody the new practice. The challenge with Holacracy is that it often feels unnatural and uncomfortable at first, even frustrating on occasion, as it was for Dustin in the first months “riding” the backwards brain bike. Not to mention the twenty minutes it took him to relearn how to ride a normal bicycle after he had learned to ride backwards — a testament that it requires unlearning the old practice in order to embody the new one. The first steps of Holacracy take some unlearning as well. In fact, many of the behaviors and practices that made people successful in conventional management hierarchies are actually counterproductive, not to say harmful sometimes, in self-organizing systems such as Holacracy. But with regular practice, the new habits get more familiar and comfortable, and the old ones less robotic. As per Sandlin’s comment in the video, “knowledge does not equal understanding”: indeed, knowledge is a cognitive operation of grasping concepts while understanding is the process of experiencing these concepts, making sense of and embodying them. One key difference between these two stages is that one is merely intellectual while the second makes an impact on to the emotional level, in addition to encapsulating the cognitive stage. The brilliant taxonomy below illustrates this distinction and depicts the developmental process that is at at play here. It shows how data is transformed into more complex phenomena and highlights what understanding is and ultimately what wisdom is all about — connecting the dots. With that in mind, there’s nothing surprising in saying that the best way to learn Holacracy is by trying out its processes and rules. Don’t expect to understand this social technology by reading the Holacracy constitution or the Holacracy book. That would be like trying to learn how to play soccer or ride a bicycle by simply reading the rules of the game. Practice instead. The Holacracy constitution is not meant as learning material anyway, but as a document for reference. Now let’s look at the notion of behaviors through the villain-victim-hero narrative. About two years ago, I came across David Emerald’s model, The Empowerment Dynamic (TED), which offers a “great framework to look at the effect of Holacracy,” as my former HolacracyOne colleague, Brian Robertson, pointed out. Holacracy is often compared to an organizational “operating system” (OS) that increases transparency, accountability, and agility. Similar to the tech metaphor used to describe Holacracy, the Dreaded Drama Triangle (DDT) is nothing less than a “personal OS” in which the quality and character of the relationships are dysfunctional. Just as you cannot boot up an app designed to run on iOS 10 on an iPhone still running on iOS 7, one who is still moving through life with a “DDT OS” will not be able to run his(her) “TED navigation system”. The DDT describes the toxic nature of three intra and interpersonal roles: the Victim (primary role who feels powerless), the Persecutor (which the Victim blames for their suffering) and the Rescuer (who steps in to relieve the Victim’s suffering). As described in the diagram above, all three of the roles have their roots in the problem orientation and focus on what they don’t want and don’t like, seeing the others as the problem. TED views the Creator as the healthy version of the Victim. The Creator taps into an inner state of passion with a focus on the desired outcomes. It views the Challenger as the healthy version of the Persecutor. The Challenger is focused on learning and growth, as a positive alternative to putting someone down by criticizing, blaming, or controlling. It views the Coach as the healthy version of the Rescuer. The Coach uses compassion and questions, provides encouragement and support, in place of “rescuing” actions. One illustration of the shift from Victim to Creator — an extreme version of non-victimization — is referenced in the book Man’s Search for Meaning by Viktor E. Frankl, who was at one point interned in Nazi concentration camps. In the midst of a devastating situation, Viktor realized that the one thing his captors couldn’t take away from him was his perspective and the way he chose to deal and respond to the atrocities life threw at him. Just as TED entails a shift in mindset from the DDT, Holacracy does too from a conventional organization’s standpoint. In organizations running with Holacracy, there’s no longer a “heroic” leader to get people to meet the company’s needs or to complain to (which would maintain the unhealthy dynamic). Instead, there’s a process that gives space and power to anyone in the company to address their organizational tensions. Therefore, within such a context where anyone can make change happen, it is fairly challenging to justify a victimhood stance. Most likely, individuals who choose to adopt such a stance do it somewhat unconsciously. 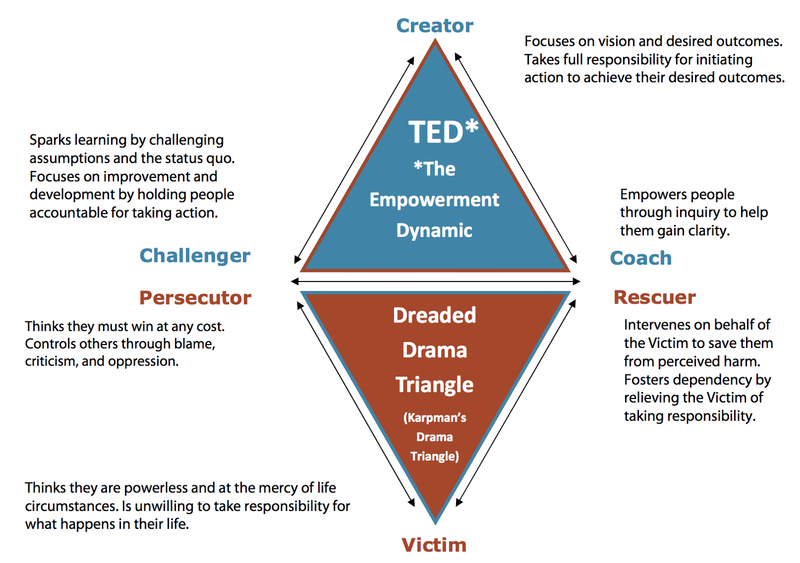 This leads us to an interesting and complex question which is how can one shift from the Dreaded Drama Triangle to The Empowerment Dynamic? How does one move from being a victim of their circumstances to a creator of their circumstances? How does one move from a reactive to a responsive mindset? How does one move away from a manager-employee mindset to a leadership-driven attitude, including all the challenges such a shift implies: fear and resistance to change, plain confusion, people’s sense of identity and self-worth. These are questions I will tackle in a future blog post (Part 4 and 5). ☞ Want to get my next writings? Connect via Twitter. Follow me on Medium. ☞ If you liked this read, don’t forget to click the heart button💚 below.